Atlantic Coast Point Judith to New York. 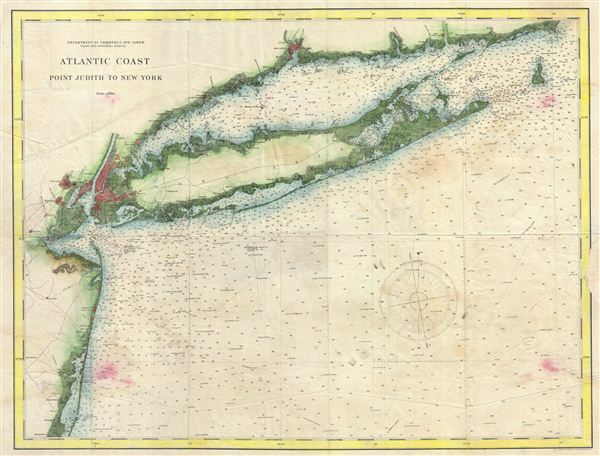 An uncommon and appealing nautical chart of New York City, Long Island, the Connecticut coastline adjacent to the Long Island Sound, and parts of New Jersey to Barnegat Bay. A beautiful example of the Coast Survey's work in this region with countless depth soundings throughout and some good inland detail along the coast, especially around New York City, New Haven, and the Long Island Forks. Printed and engraved by the Norris Peters Company of Washington D.C.
Norris Peters Company (fl. c. 1880 - 1920) were Washington D.C. based lithographers and printers. The firm was awarded numerous government contracts to print patents, coastal charts, plat books, and geological survey maps. The company was subsequently involved in numerous law suits regarding government remuneration, illegal lobbying, and intellectual property rights. The Norris Peters Company was headed by Daniel Fraser and maintained offices at 458-460 Pennsylvania Avenue, Washington, D.C.
Good. Map exhibits some wear and toning on original fold lines as well as a few additional creases. Some staining near the South Fork, in the lower right, and in the lower left. This chart was used for actual navigation and has some old pencil marks, partially erased, to that effect. Some damage to lower left margin - repaired.